The Irish Fairy Door Company make high quality wooden fairy doors perfect for little ones to bring the magic of fairy life into their homes and gardens. My little 6yr old is a great believer in all things such as Santa, the Easter Bunny and of course the tooth fairy which he has been desperate to leave a tooth for but has yet to have lost one of his milk teeth, although I knew a fairy door would be perfect for him. The Irish Fairy Door comes with everything you need to make a perfect home for a fairy and encourage lots of imaginative fun with little children. We received the blue arched fairy door to try out and I knew my little Mister B would love setting it up as a few days prior he had the start of his first ever wobbly tooth! The set is well thought out and comprehensive in the pieces included. Mister B was thrilled with the set when it arrived and amazingly got his first wobbly tooth a few days before it actually arrived so was very excited to set this up ready for the tooth fairy. He was thrilled with the door and set it up on the skirting board outside his bedroom (at my suggestion thinking it will be easier to access than inside his room!). The door is of very good quality, all wood with great detail that even Mister B commented on about how much he liked. It can be used indoors or outside (just requiring a coat of varnish to help weatherproof) but ours was going to be inside as Mister B’s whole focus was on the tooth fairy. The Fairy Welcome Guide is a lovely bright booklet that follows a story of a grandfather explaining to his grandchildren about the life of fairies and how to set up the door and believe in the little visitors. The Fairy agreement is a scroll outlining your responsibilities which is really sweet and lovely. Mister B wasn’t too bothered about the two above items and favoured the cute little key in a bottle and the stepping stones. In fact we had a bit of a meltdown at the prospect that the fairy would take the key away and that would be how you knew she had visited! So we decided that the fairy probably wouldn’t take the key and just use it when she arrived. Mister B spent that day setting up his fairy door and was really excited with all the pieces. Within a week or two his wobbly tooth fell out!! I have never seen so much excitement and he couldn’t wait to put his tooth on one of the stepping stones ready for the tooth fairy to find at night whilst he was sleeping. He wrote a cute little note on the note paper and left it all set up ready to check out again in the morning. Of course we didn’t want to take away the key due to upsetting him, so left the bottle on it’s side with the cork stopper out and the key on the floor. His tooth was gone and a £1 coin had appeared on the stepping stone instead. Also the note he left against he wall was on the floor which totally convinced him that the tooth fairy had read it. Overall this set of a fairy door from The Irish Fairy Door Company has been a total success. My little boy really believes in the tooth fairy and his whole experience of losing his first tooth has been a pleasurable one that has been very much enhanced by the fairy door. He is a total believer and having a special place to leave his tooth meant so much to him. He can’t wait to lose another one now and write a new note for the fairy. This is a great concept that brings so much excitement, fun and memories to children – well worth checking out! 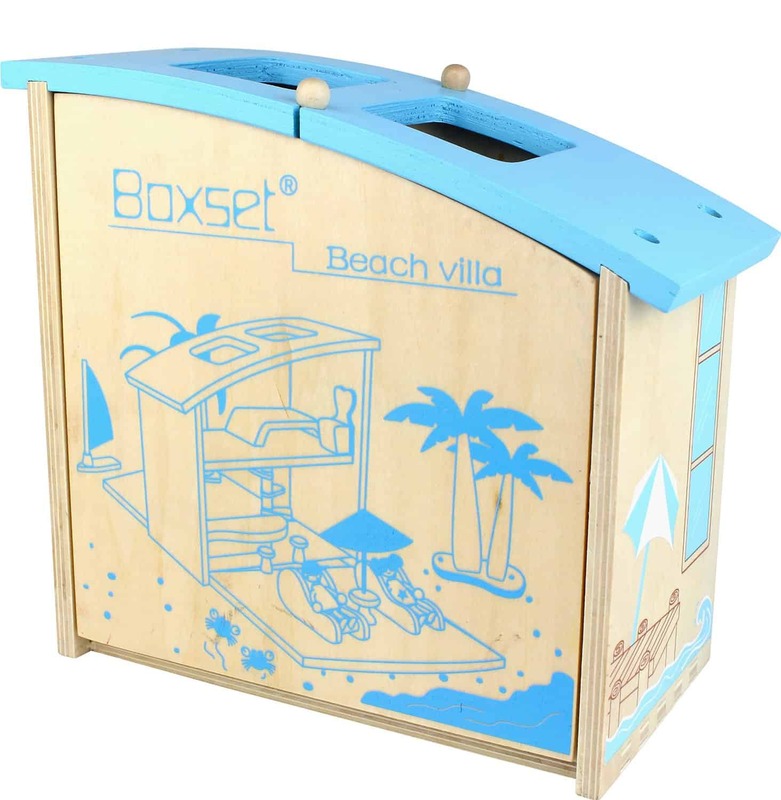 Casdon Wooden Beach Villa Play Set is a completely fold up self contained playset that you can pack up and take along with you with carry holes in the top. The playset has two fold down sides to set the scene and inside two floors with stairs going up to the top floor. The scenes on the open sides depicts a beach to help bring this set to life and aid young ones imaginations. There are also a number of accessories included, from a beach bar to stools, bed, tv, windsurf board, sun loungers, palm trees, two wooden figures plus a few more. I love how the playset can be packed up to just a small size box with all the contents inside for portable play and also to keep things tidy. 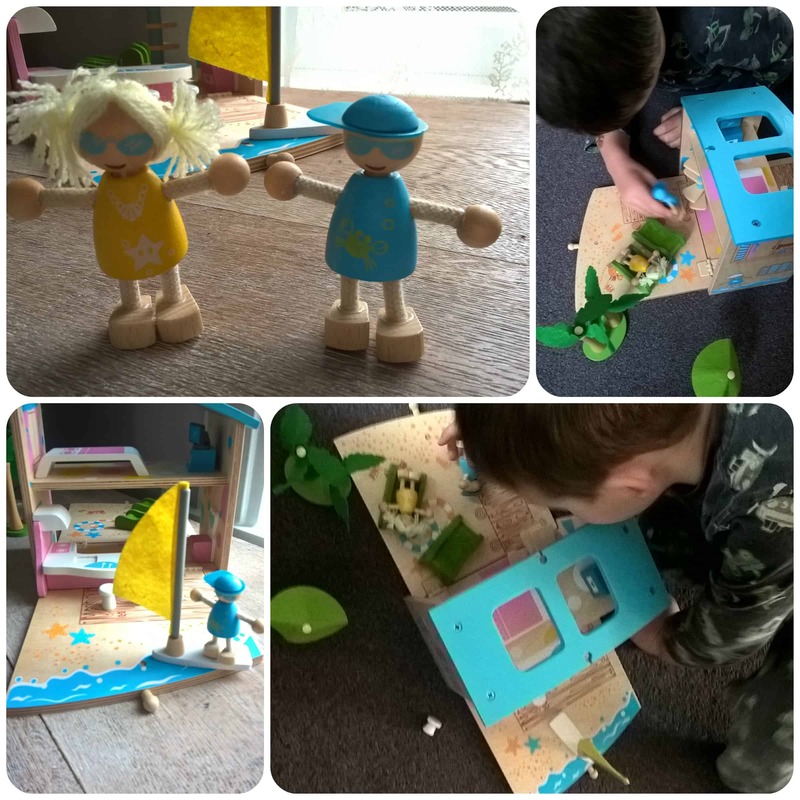 Children can really let their imaginations go with this set, as 4 yr old Mister B did. He had lots of adventures especially with the wind surfer! There are plenty of pieces included to use to play although Mister B did add in his own boat so that both figures could go sailing off to sea! 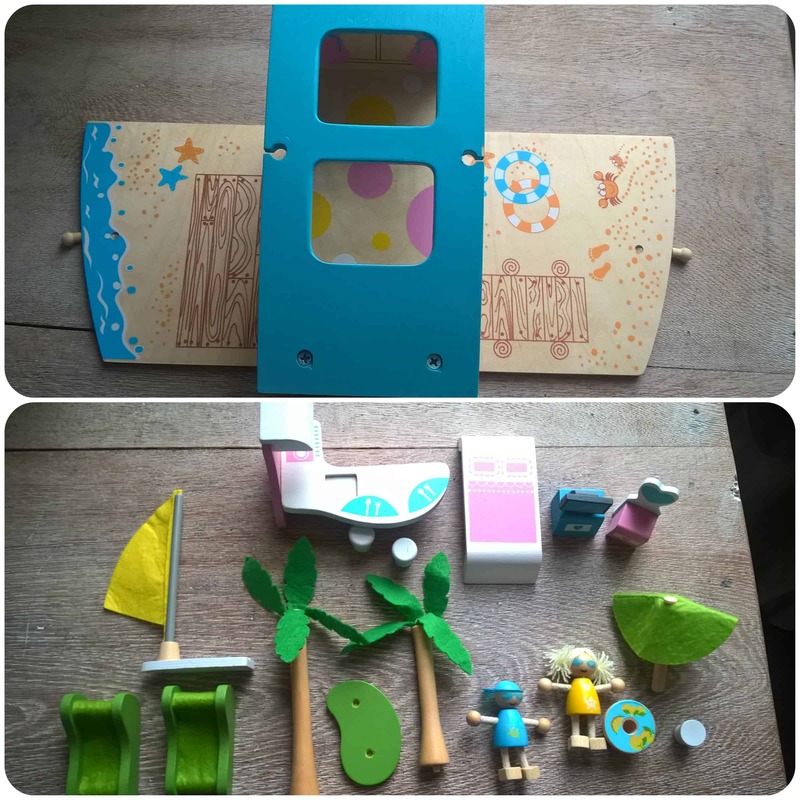 Being wooden this Casdon Beach Villa playset set is sturdy and durable, there are no small pieces to break off and everything that is glued together feels strong. Aimed at children 3-6 years it really is something for those who love using their imagination through play as my son does. 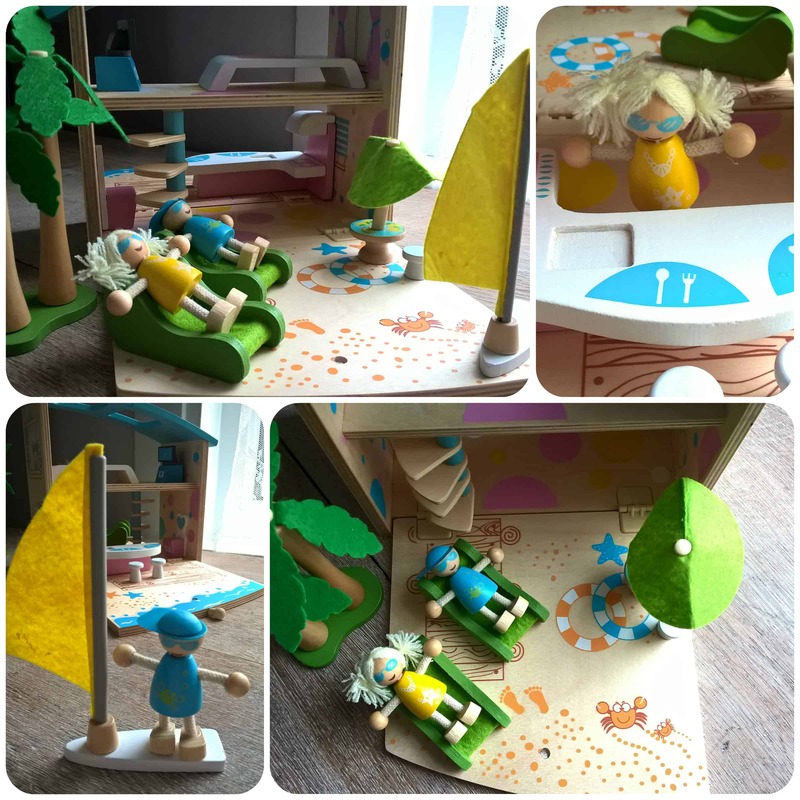 There are other wooden playsets of a similar style to this one available from Casdon, including a Castle and Pirate playsets, so be sure to check them out! All reviews are my own and my family’s opinions and we received the toy in order to write an honest review. The Hape Rock A Bye Cradle is a toy that will appeal to every young child that loves to play with dolls. Hape, a German toy company, have created this gorgeous, high quality wooden Rock A Bye Cradle to rock your dolls to sleep in that I’m sure will be the envy of any little girl. This beautifully crafted cradle is made from wood with painted end panels. It comes flat packed in five pieces that require minimal assembly to create a sturdy, made to last toy. The wood has a really smooth finish which reflects the high standards from Hape. 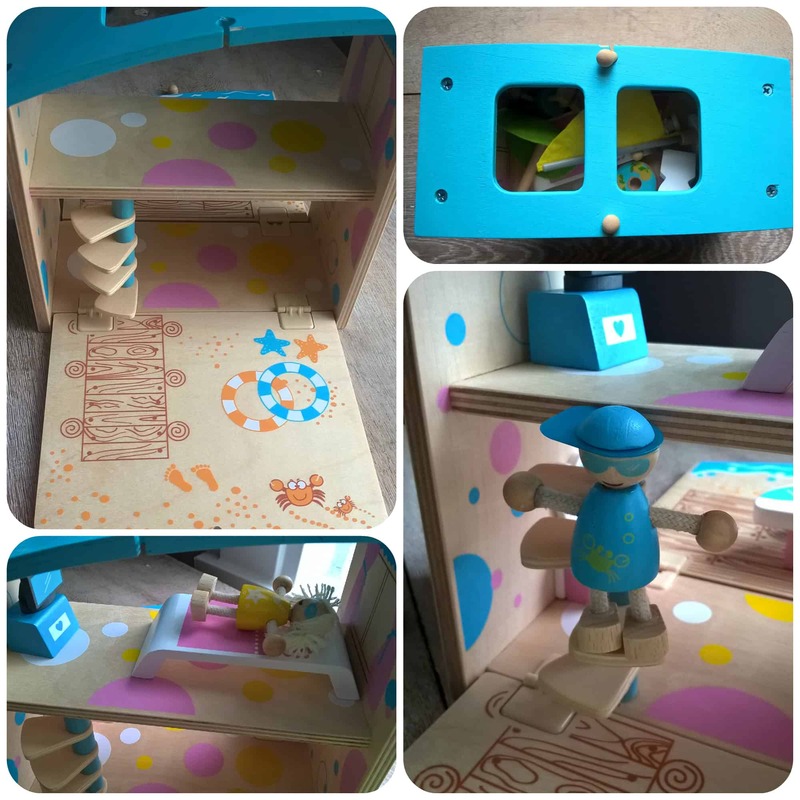 The cradle is aimed at children aged 3+, and is a toy that encourages imaginative play, creativity and role playing. It also helps to boost social skills through communication and cooperation with others. My two children aged 5 and 2 (almost 3) have had hours of fun with this already. Using it along with a dolls pram they have taken dolls for walks then brought them back to feed them and rock them to sleep. They done some great role playing, being a family with their babies and although at times they have wanted to do the same thing at the same time with the cradle, they have had to learn to share and cooperate with each other. 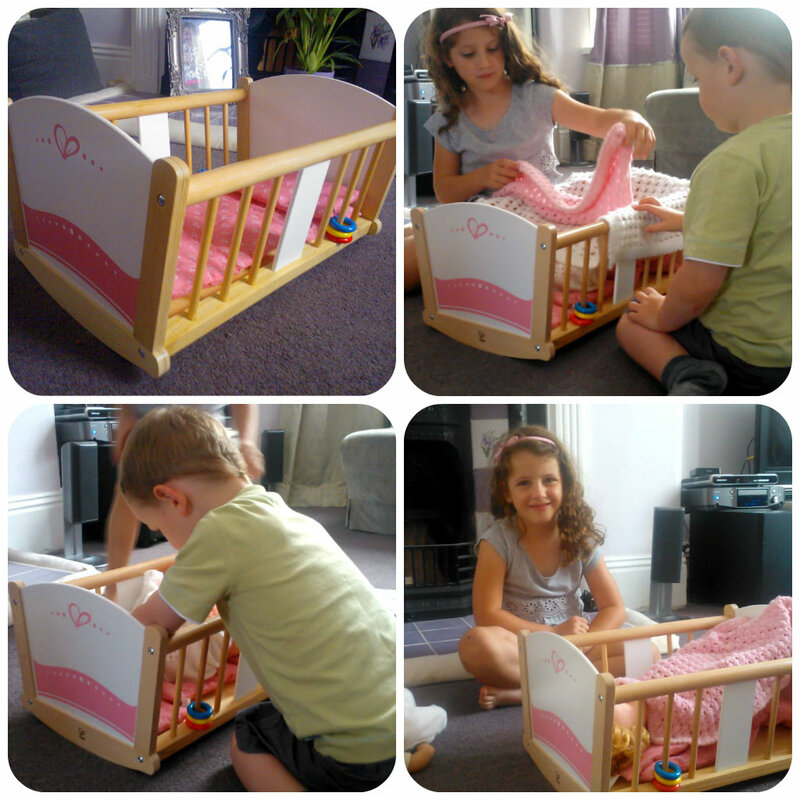 The cradle comes with an included pillow and quilt/mattress in a pretty pink, which have added to the play value. There are also some lovely details in the little plastic rattle rings on the bars of the cradle for dolly to play with and also the ability to rock the cradle from side to side. This is a beautiful toy, that I’d highly recommend. 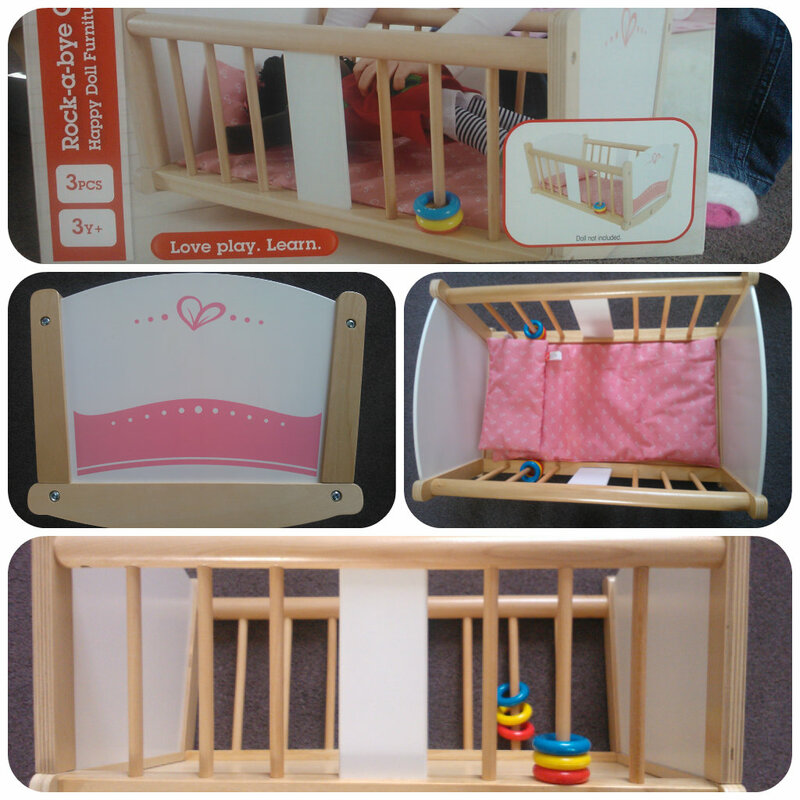 The Rock A Bye Cradle from Hape would be a hit with any little girl. (oh and boy – Mister B loved feeding his doll a bottle then tucking her in the cradle for a sleep).